VanLife Crisis: Changes on the horizon? Well I think I am ready for a change from the G10. I ran into an electrical problem, which I eventually fixed with a new battery. But its become evident to me that it wont be the last thing, and I am pouring money into a sinking ship, patching holes as more spawn. Even if nothing major is wrong, I am constantly worrying and wondering when something will leave me stuck somewhere, maybe in traffic. I broke down and went to a dealership. I really hate the idea of financing something, pinning me down for years, but its not so hard to digest when i think of it like buying a home. But despite claims on the radio to the contrary, they didn't have what i really wanted in stock and even when I was willing to compromise, they wouldn't give me a loan without a cosign. I don't have bad credit, indeed I have no credit at all. The report comes back blank. Their ads love to tote how they will lend to anyone....but i guess they will lend to anyone who has family or very trusting friends with good credit. I do not. So now I am socking away the money i would have made on a payment, and I am hunting for a pickup truck. 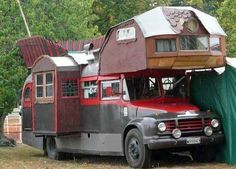 I decided I wanted to build my own truck camper, so when I do get out on the road I can go anywhere. I also like the idea of total customization, a van is an open canvas, but this time I will be making the canvas too. Now to just find one I can afford, while avoiding dumping cash into the van in the mean time.